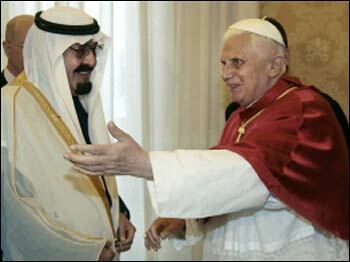 King Abdulla and Pope Benedict XVI greeting each other. Photo: religion.lilithezine.comSeizing an opportunity to improve Catholic-Muslim relations in spite of enmity and mistrust, King Abdullah of Saudi Arabia arranged a tour of Europe and requested an audience with the Pontiff at the Vatican. A date was set, and for 30 minutes they spoke of the “value of collaboration between Christians, Muslims, and Jews.” They focused on the need for religious and cultural dialogue “for the promotion of peace, justice and spiritual and moral values, especially in support of the family.” Both sides emphasized the need for a “just solution” to the Israeli-Palestinian conflict. The World Interfaith Harmony Week website reports over 400 events in 2013 in 53 countries. This year there should be more. Never underestimate the power and goodliness of a well intentioned conversation; it just may change the world. Celebrate your faith in community and list your World Interfaith Harmony Week event here. An earlier version of this article was published by the Euphrates Institute, where Rebecca Tobias is vice president of the Board of Directors.